Published Friday 25 January 2019 A cold snap is expected in London, with temperatures expected to stay very low over the next few days and local people are advised to prepare for further cold weather. There is a possibility that it could snow up until to Wednesday evening and the council's emergency procedures are in place. 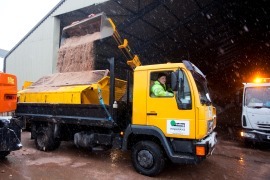 Gritters are on standby and will be sent out to grit primary routes across the borough to keep main roads moving whenever freezing conditions are forecast. Every year Ealing Council works with Transport for London, the other London boroughs, the City of London and emergency services to put plans in place in the event of severe winter weather. Severe weather can sometimes result in council services being disrupted, for this reason residents are reminded to keep up to date by following Ealing Council on twitter.